John Lasseter, chief creative officer of Disney Animation Studios and close friend of late Apple CEO Steve Jobs, is taking a six-month leave of absence after allegations of inappropriate behavior toward female co-workers. Lasseter announced the time off in a vaguely worded internal memo to employees obtained by The Hollywood Reporter. Though the letter does not mention sexual misconduct, a second report from the publication details specific incidents from women who received unwanted advances from the Pixar chief. Of note, actress Rashida Jones, credited as a writer on Toy Story 4, left the as-yet-unreleased project due to Lasseter's actions. "I've recently had a number of difficult conversations that have been very painful for me," Lasseter writes. "It's never easy to face your missteps, but it's the only way to learn from them." According to unnamed Pixar employees, Lasseter is "well-known" for hugging employees and others in the entertainment industry. Other actions are less innocuous and include "grabbing, kissing, making comments about physical attributes," the report said. 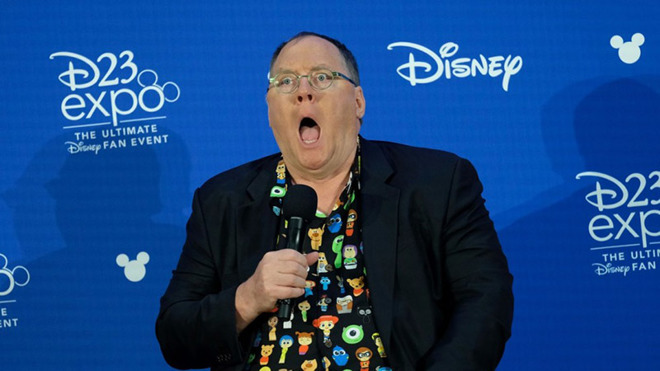 Some Pixar employees took defensive measures to steer clear Lasseter's advances, from turning their head to avoid kisses to performing a move dubbed "the Lasseter" that prevented the executive from placing his hands on their legs. The recipient of two Oscars, Lasseter is perhaps best known as a co-founder of Pixar, a computer animation studio that started life as part of Lucasfilm. With funding from Steve Jobs, who later served as Pixar's CEO in 2004, the company splintered off into its own entity and went on to produce critically acclaimed films like Toy Story and Finding Nemo. Disney purchased Pixar in 2006 in a deal that netted Jobs about $4 billion as Pixar's majority shareholder. After finding success on its own and at Disney, Pixar in 2012 acknowledged Jobs' influence by dedicating its main office building to the late tech guru. In 2011, Lasseter penned a "Fond Farewell" to Jobs as part of Time's annual "Person of the Year" issue. The animation studio executive said he thought of Jobs almost as a brother, and told a story about how Jobs asked for his approval to go back to Apple after NeXT was bought out. Lasseter plans to return to work in six months give me the opportunity to start taking better care of myself, to recharge and be inspired, and ultimately return with the insight and perspective I need to be the leader you deserve." Editor's note: Due to its political nature, comments for this article have been closed.